Saratoga’s options for hotels, motels, inns and bed & breakfasts were already pretty stellar, but look at the spiffy newcomer on the block. Bringing a Palm Springs aesthetic to the heart of Broadway, The Downtowner’s makeover has turned the reliable, old Saratoga Downtowner into a modernist hot spot, complete with 42 newly renovated rooms that have whitewashed the motor-lodge into a gleaming magazine-worthy spread. Located on what is known as the “50-yard line” of Broadway at the corner of Division Street, The Downtowner has always attracted eager guests, thanks to its location and the nifty indoor pool on the ground floor of the inner courtyard. 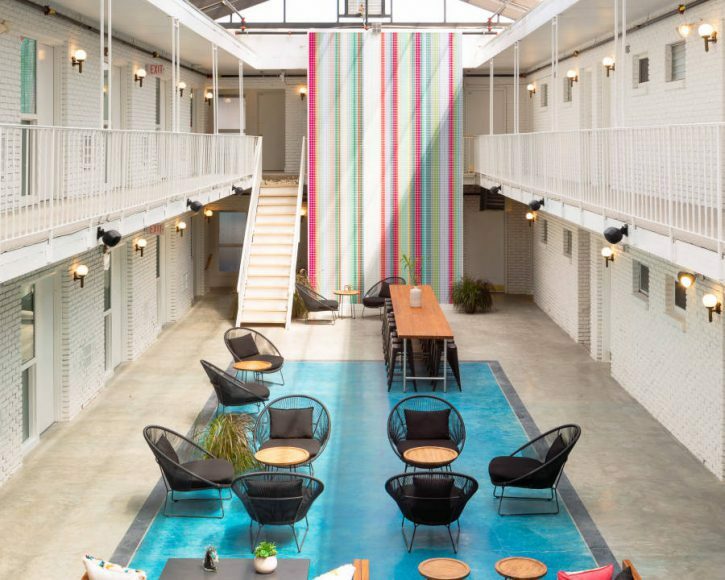 That pool is gone now, but the transformed inner courtyard /atrium is the hallmark of the newly renovated motel from Lark Hotels, which owns boutique motels in several states. 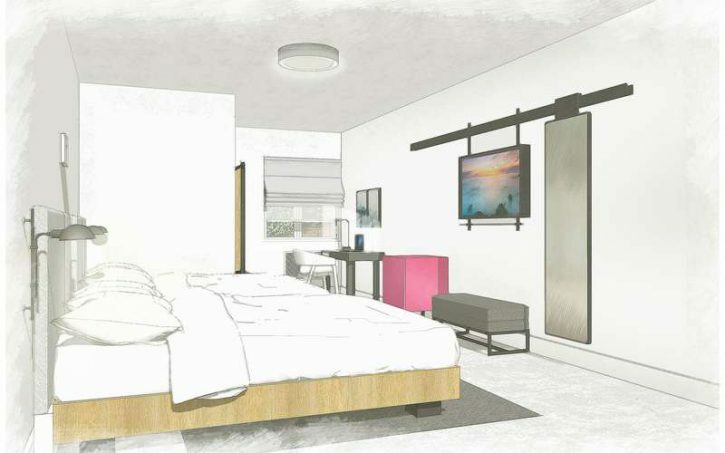 The motel makeover was designed by California-based EDG Design, and each guest room pays homage to a variety of modern and pop art styles. The Downtowner is open, and reviews from its first guests are two thumbs-up. Rooms range from a small “micro-queen” up to the Lark Suite — complete with a secret rooftop garden — along with standard King, Queen rooms, and Double Queens. In a nod to the kinds of parties that come to Saratoga to hang out together, and in keeping with communal housing trends in other cities, The Downtowner also has the Friend Zone, a larger, suite-like option for up to four people. There are pet-friendly rooms, as well as two ADA-accessible kings that can be booked directly over the phone. Room rates at The Downtowner range from $199 to $499 per night for double occupancy, depending on room type and time of stay. Hotel amenities include a daily, curated small plates breakfast spread, afternoon treats, Lather bath amenities, hospitality stations with coffee, tea and water, 24-hour front desk and concierge service, and room essentials like wine glasses, corkscrews, irons and hairdryers.